This is a great game, involves lots of energy and is fast-paced and can be played inside or outside. To start off with divide the young people into 3 or 4 teams and get them to number off. Get each team to move to a corner of your meeting space or spread out along the edges. In front of each team draw a chalk circle (or use something to mark a small area like a hoop). 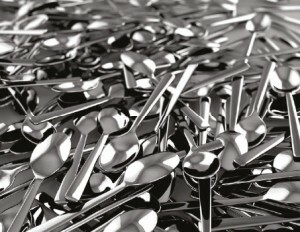 Place all the spoons in a bowl in the centre of the room. Call out a number and the young people run to collect a spoon and deposit in their circle. They can only carry 1 spoon at a time and the winning team is the one who gets the most spoons. Once all the spoons have gone reset the game. The team that wins the most times are the champions. You can change the game to make it easier of harder by putting more or less spoons in, calling more young people from each team to get spoons, allowing spoons to be taken from teams as well as the centre, making the playing area bigger, or using different items other than spoons.